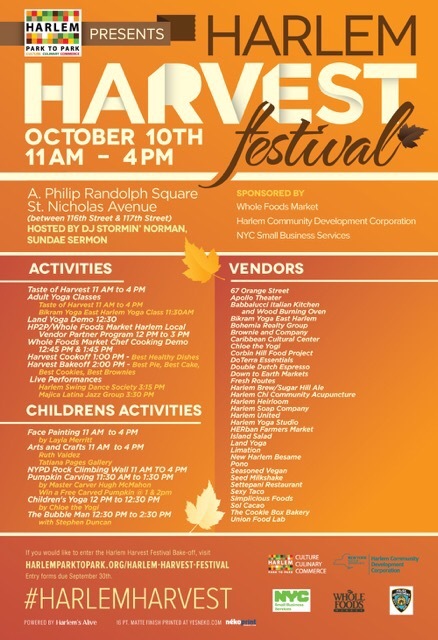 Harlem Harvest Festival happening today, October 10 | HarlemGal Inc. This entry was posted in 116th Street, Adam Clayton Powell Jr. Blvd., baking, business, Community, education, Events, food, Free!, Harlem, Harlem bloggers, Harlem blogs, Harlem businesses, Harlem restaurants, HarlemGal, kids, New York, New York City, NYC, restaurant row, restaurants and tagged Harlem, Harlem Harvest Festival. Bookmark the permalink.